The special high courts investigations on serious frauds will start functioning by August this year, Prime Minister Ranil Wickremesinghe said yesterday. The Prime Minister said this at an election rally in Gampaha last evening.
" Cabinet paper submitted by Minister of Justice Talatha Atthukorala was approved by the Cabinet today and it will be presented to Parliament soon. 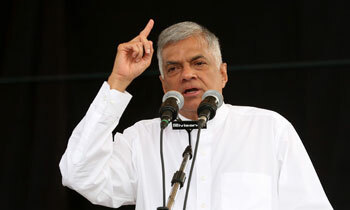 UNP's stand on the issue is that the new courts should initially hear the cases on corruption which has taken place during the present regime", Mr Wickremesinghe said.
" The practice that had been carried out in the past on corruption is that a new government conducts investigation on corruption that had taken place during the previous regime. However, this regime had changed this practice and conducted investigation on bond issue" he added. He then went on to talk on the development plans lined up by the government for the country. State Minister Ruwan Wijewardene said both the President and the Prime Minister had agreed to deal with corruption together. He said those in the UNP and in the SLFP will have to face punishment if it is proven that they have been engaged in corruption.
" There are some who were engaged in corruption during the Rajapaksa regime, who have become ministers in the present regime. Some who were alleged to have involved in the hedging deal have become ministers in this government and talking of corruption in this government. They will be penalized if found guilty" Mr Wijewardene said. In Ranil's dreams there was a court is being built to prosecute the former Rajapaksa regime it will be in final completion phase and finish by this August. The new courts should initially hear the cases on corruption which has taken place during the present regime", Mr Wickremesinghe said. It's like reading the book backwards....... of course that's how the brain of the politician functions ! Conveniently asleep for 3 years, no action against Wijedasa Rajapakse, and now pretending to spring into action against the corrupt. The first barrier to investigate the Royal family corruption ispremier. Why wait for August, Speed up or give up your premiership. Mr. Foot and Mouth Disease, it is more than 4 years and we are still waiting to see people getting sentenced instead of getting "instant maggi noodles" bail and enjoying their stay at home with impunity. Both present and past should be investigated simultaneously. Already 3 years have gone and are you are going to delay old cases more. Come on, recruit more judges even retired to fast track them. Only then people will have confidence in the government. He knows well how to steer his boat avoiding currents and stormy waves. What people today need is not courts but justice. RW is buying time again to occupy his positions. Firs of all those courts should investigate why for the first time in Sri Lankan history the Centra Bank was taken by Ranil from the ministry of finance? why wait for so long .open it before April so we can light crackers for the new year and the opening of the courts as well. First punish bond scam robbers.